Much of my work has been behind the scenes infrastructure stuff, but some of that is translating into new features that craigslist users can see. And, as of this morning, a lot more users are seeing the fruits of that labor. As I noted a few weeks back in Sphinx Search at Craigslist, I've been hacking a lot on search. Here's a screen shot to show you what I've been calling "nearby search" (though "nearby results" is probably more appropriate). If you run a search in a city and there aren't many results, we'll also run the search in nearby areas to see if we can find matches there too. 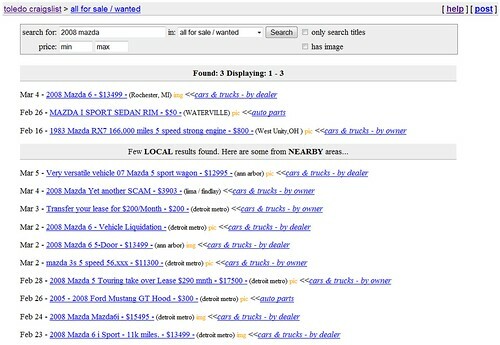 The above example was a search for "2008 mazda" in my hometown of Toledo, Ohio. The "nearby" results are clearly separated from local matches and local matches are still given priority. The feedback has been generally positive so far. Though, with any change, some folks aren't happy. I can't say it's going to stay in this exact form. We may need to tweak the interface, the radius of the nearby search areas, and so on. But on the whole I think it's a helpful improvement when you're looking for something that's a bit harder to find and you're willing to drive an hour or two. As of earlier today, it's available in most smaller and medium sized US cities. It'll probably come to the remainder of cities before long too. I've been testing it for about a week and a half, starting with about a dozen cities and then adding about twenty more late last week. This morning I mostly flipped the big switch. Of course, this opened the flood gates for similar feature requests: custom radius searches, state wide searching, search ALL of craigslist, etc. In related news, a couple months back I expanded the search help page to include advanced search syntax, including grouping, negation, OR queries, and more. Search within results would be indispensable for us apartment renters. Frequently I search the apartment rentals by 'caltrain', and then want to figure out which one have 'fitness' as well, and currently searching for both terms (I think) gives me caltrain OR fitness. Actually, searching for both gives you AND by default. Looks great except for the fact that rochester MI is almost a 2 hour drive from Toledo Ohio. Thanks for sharing some behind the scenes information. It is nice once all that hard work starts to be noticed by users. "Nearby results" reminds me of the work of Matt "Black Belt" Jone at Dopplr, who is exploring similar things. I suspect that some sort of grouping of "nearby" results would be useful. The geography may become more important than "what's newest". Maybe I am willing to go to Cleveland to find that car, but not Detroit. I am lost for words as to why such a search is such an issue. Really every 'home' page for Craigs ought to have a form whereby there can be such a search together with filters of preferences such as by state, by region, by country. Really what is the big issue over this. Let the site be searched methodically and freely. As I'm looking for housing on Craigslist, one feature I really wish existed would see a toolset under the link where you could hide it, emphasize it (assign it points? ), save it, etc. Are there any plans for something like this? You mean a sort of watch list for results you've seen and liked? Search is pretty fast now. Thank you for the new search. Craigslist is the biggest and ever green site for the members who Knows.I have taste the Fruits of Craigslist.And thank to the People Who have help me a lot. I've played around a bit with sphinxsearch and localization, although I took a non standard approach. I was wondering what your memory requirements were like for comparison. I'd be very interested in looking at your MySQL conference slides as well. I was just wondering what methods you use for your geo location to where the user is at physically or us it just based upon the original search area, it is based on GeoIP or something else?